Today is Valentine’s Day, as of writing this post. And, as they say – true romance is eternal; an hyperbolic expression now proven historically true by the archaeology news of two skeletons unearthed in one of the Diros caves in Peloponnesos, southern Greece. Dated from 3800 BC, these pre-historic remains were found to be in a ‘snug’ fetal position with one embracing the other from behind. A group of archaeologists and speleologists (under patronage of the Greek Ministry of Culture) have additionally excavated arrow-heads, pottery, beads and even a weapon (most presumably a dagger) from the burial site. This particular cave is known as the Alepotrypa (or fox hole), and was probably used as both a neolithic settlement and burial ground between the period of 6000 BC to 3200 BC. The abrupt end of human habitation in 3200 BC was rather caused by natural disaster – with an earthquake blocking the main access point of the cave, thus leading to the trapping of the inhabitants inside. 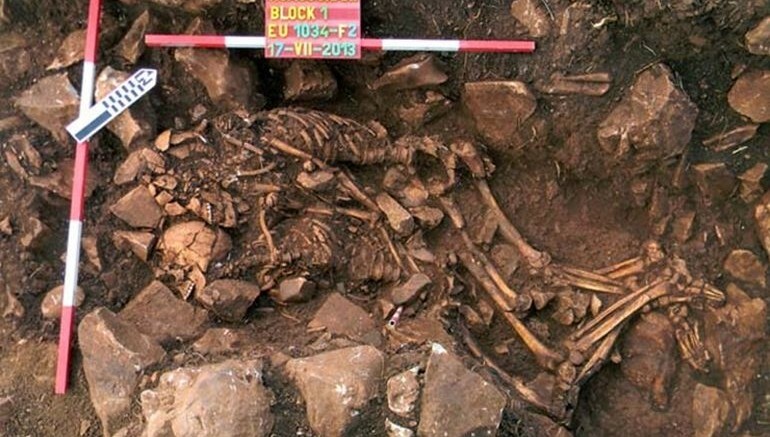 As for the couple in question here, preliminary DNA analysis have yielded that one skeleton is that of a man, while the other is of a woman. The cause of their death is however still elusive. But given the fashion of their ‘romantic’ burial, it can be assumed that both met their deaths more-or-less at the same time. The historians headed by George Papathanassopoulos, have been able to unearth other interesting objects too. This includes the aforementioned pottery and beads, along with more skeletal remains (of adults, children and even a particular embryo), However, the ‘piece de resistance’ of their finds would arguably pertain to an imposing 13-ft wide crypt with adequate gravel flooring. In any case, suffice it to say – skeletal remains in such an intimate posture are indeed rare; and furthermore, the Alepotrypa specimens are one of the oldest in this extraordinarily rare category. Image Credit: Greek Ministry of Culture.